Original story posted here on the Smyrna/Vinings Patch. 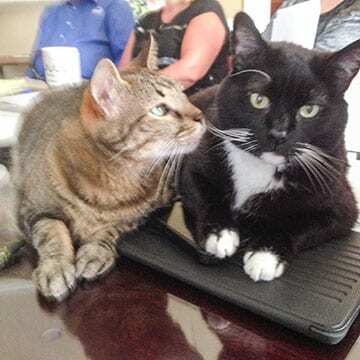 The truth about cats and dogs is they make excellent office companions as Atlanta Pet Rescue & Adoption and The Barter Company showcased the week of June 22-26 during Take Your Pet to Work Week 2015, the 17th annual celebration created by Pet Sitters International. Every day, The Barter Company is home to two rescue cats Bobo and Roscoe. The office cats have been keeping employees and visitors company for three years. “We wanted to do more to promote pet adoptions and show other companies the advantages of being a pet-friendly workplace,” explained Ric Zampatti, CEO of The Barter Company. As part of Take Your Pet to Work Week, The Barter Company employees were encouraged to bring their pets to the office and they spent two days at Atlanta Pet Rescue & Adoption helping care for the animals. The company already promotes adoptable pets from Atlanta Pet Rescue & Adoption through its “Pet of the Week” posts on its electronic newsletter. Atlanta Pet Rescue & Adoption (APRA) is a non-profit, no-kill shelter located in Smyrna, GA dedicated to rescuing and rehabilitating dogs and cats so they can be adopted into safe and loving forever homes. TYDTWDay was established by Pet Sitters International (PSI) in 1999. This annual event urges businesses around the globe to experience the joys of dogs in the workplace for just one day to celebrate the great companions dogs make and to promote adoptions from local shelters, rescue groups and humane societies. It was expanded to one week to give cats and dogs equal time as Take Your Pet to Work Week. The Barter Company, based in Kennesaw, GA, has established itself as the leading force in the barter industry throughout the Southeast with offices in Georgia and Florida. TBC provides businesses with an alternative currency network by using barter dollars instead of cash to handle transactions. The company acts as a third-party records keeper, providing clients with monthly statements that reflect all barter purchases, sales, and current barter dollar balance. For more information, visit The Barter Company’s website.